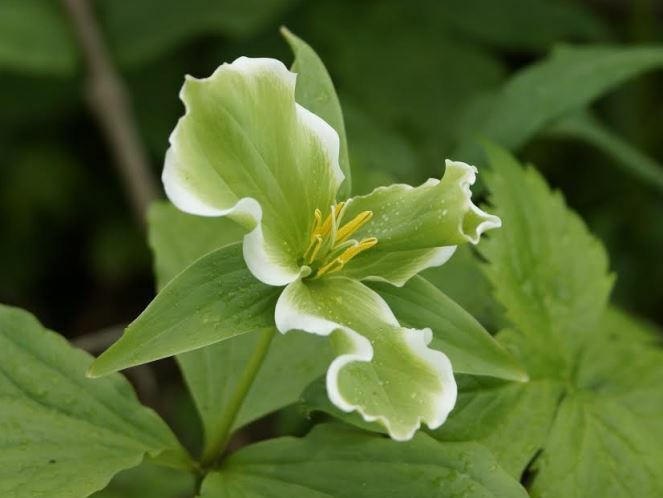 Trillium (family Melanthiaceae) is a genus of perennial flowering plants native to temperate regions of North America and Asia, and traditionally used as medicinal plants (Case, 2000). There are 49 species within the genus Trillium amongst which the white trillium, T. grandiflorum serves as the emblem and official flower of the Canadian province of Ontario. Other species include T. erectum, also known as red trillium. Many of these plants are adapted to conditions found in suburban or rural gardens. Compared with symptomless plants (Fig. 1), plants of T. grandiflorum and T. erectum with symptoms of virescence typical of phytoplasma infection (Figs. 2-3) were observed growing as weeds on a private property in the Sparta area of London, Ontario in May 2016. Plants were removed by the owner, placed in plastic bags and transported to the laboratory in ice coolers. Leaves, petioles and flowers were excised from eight symptom-bearing and two symptomless plants of each species. Total DNA was extracted and used as a template for a nested PCR assay with universal primers that target the phytoplasma 16S rRNA gene, R16mF2/R1 for the first PCR reaction, and R16F2n/R2 for the nested reaction (Gundersen & Lee, 1996). All samples from symptom-bearing plants yielded R16F2n/R2 amplicons. No PCR amplicons were obtained from the symptomless plants. One R16F2n/R2 amplicon from T. grandiflorum and three from T. erectum were purified (EZNA Cycle Pure Kit, Omega Bio-Tek, USA), cloned (pGEM-T Easy Vector, Promega) and sequenced (University of Toronto, Canada). Sequences were compared with those of phytoplasmas in NCBI. Sequences from T. grandiflorum (Genbank Accession No. KX470428) and T. erectum (KX470427, KX470429 and KX470430) shared over 99.7% sequence identity and were 99% similar to those of phytoplasma members of the group 16SrIII (Western X-disease). Phylogenetic analysis (using MEGA v4.0) of the 16S rDNA sequence (Fig. 4) supported the grouping of the phytoplasma isolated from both T. grandiflorum and T. erectum plants as a 'Candidatus Phytoplasma pruni'-related strain, with 99% sequence identity to the reference strain for the species (Milkweed yellows phytoplasma, 16SrIII-F, HQ589200). 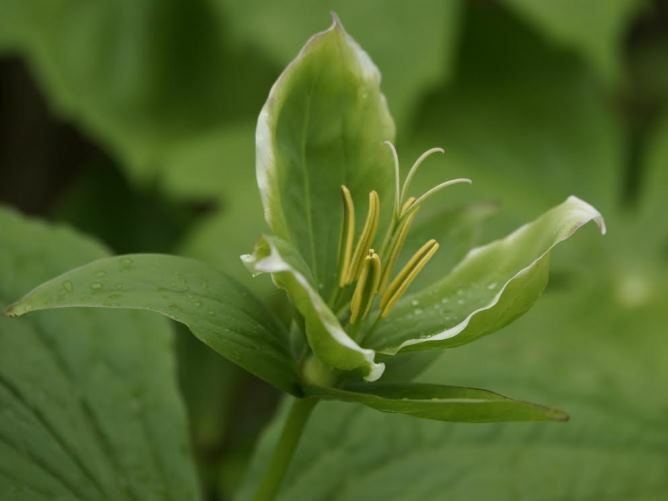 No phytoplasmas have been reported from Trillium plants in Canada. The X-disease (group 16SrIII) was first reported in 1941 in Ontario in the Niagara peninsula (Stevens & Stevens, 1947). In 1971, peach X-disease was detected in Essex County (Dhanvantari & Kappel, 1978) affecting more than 50% of peach orchards. In North America, phytoplasmas of the 16SrIII group are associated with several diseases in cherry and peach (Scott & Zimmerman, 2001). The presence of a 'Ca. 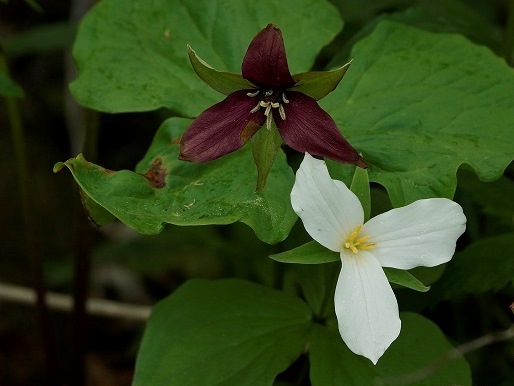 P. pruni'-related strain in Trillium not only poses a threat for T. grandiflorum as a protected species, and other Trillium species in Ontario, but also for other plant species grown nearby. To our knowledge, this is the first detection of a phytoplasma in Trillium species in Canada and worldwide. Figure 1: Symptomless plants of T. erectum and T. gradiflorum grown in the Sparta area, London, Canada. Figure 2: Symptoms of virescence observed in T. erectum plants collected in the Sparta area, London, Canada. Figure 3: Symptoms of virescence observed in T. grandiflorum plants collected in the Sparta area, London, Canada. 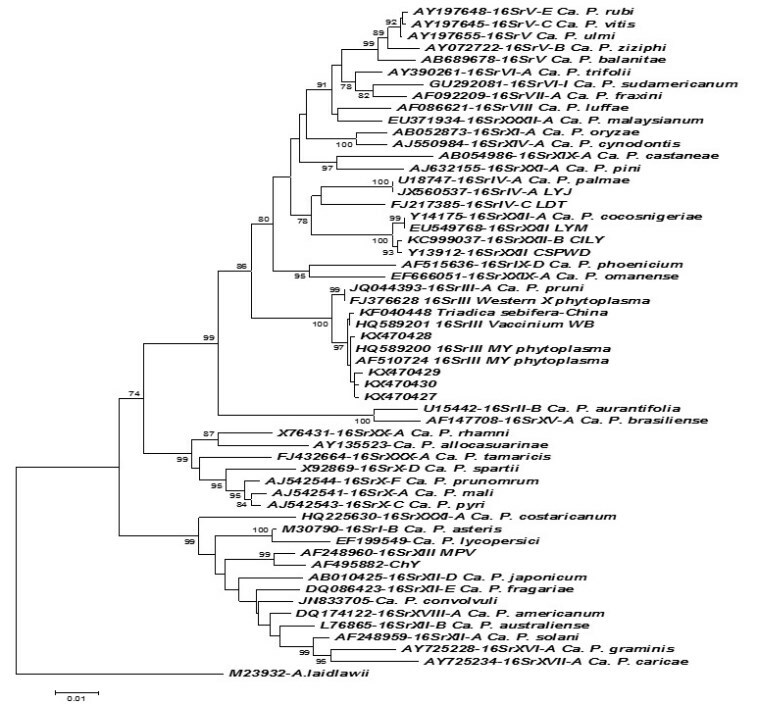 Figure 4: Phylogenetic tree based on R16F2n/R2 sequences of the Trillium phytoplasma and reference 16Sr phytoplasma groups. Ribosomal group/subgroup when available is reported after GenBank Accession No. Bootstrap values >60% are expressed as percentages of 1000 replications. Branch lengths are proportional to the number of inferred character state transformations. Bar indicates 0.01 substitutions per nucleotide position. MY: Milkweed Yellows; WB: Witches’ Broom; MPV: Mexican Periwinkle Virescence; 'Ca. P. species’: 'Candidatus Phytoplasma species'. Dhanvantari BN, Kappel F, 1978. Peach X-disease in southwestern Ontario. Canadian Plant Disease Survey 58, 65-68. Gundersen DE, Lee IM, 1996. Ultrasensitive detection of phytoplasmas by nested-PCR assays using two universal primer sets. Phytopathologia Mediterranea 35, 144-151. Scott SW, Zimmerman MT, 2001. Peach rosette, little peach, and red suture are diseases induced by a phytoplasma closely related to Western X-disease. Acta Horticulturae 550, 351-354. Stevens NE, Stevens RB, 1947. Plant diseases during the years 1941–1945 in the United States and Canada. Botanical Review 13, 92-115.